What do you see on your monthly electric bill? More importantly, what don’t you see? If you live in the Tennessee Valley and get your power from TVA, your bills have probably been going up due to rising fixed fees TVA approved for your local power company (or LPC). However, a majority of TVA ratepayers cannot see the fee on their monthly bills. Customers deserve to know what they are paying for each month. This lack of transparency has caused us to sound the alarm for transparency: let me see the fee! TVA attempts to disguise rising fixed fees by touting low rates, but your bill is more than TVA’s rate. Monthly bills are comprised of 1) TVA rates, 2) usage, & 3) fixed fees. Just as fixed fees continue to increase, TVA continues to brag about low rates while simultaneously raising them with another 1.5% rate increase just last week. These increases, even if you can’t see them, are hurting your pocket book. Of the 88% of surveyed TVA ratepayers, 85% do not have a visible fixed fee on their monthly bill. SACE reviewed electric bills from over one hundred LPCs, representing 88% of the ratepayers in the TVA service territory. At least 85% of the LPCs do not list the fixed fee on their residential electric bills. Transparency is a defining and desired value in government, leadership, consumer rights, and utility rate making. Electric rates should also be simple: simple to locate, simple to understand, and simple to manage. TVA is a government corporation that serves 154 local power companies (LPCs), the utilities that administer bills, collect revenues, and manage the distribution grid. LPCs serve over four million customers. It is the duty of both TVA and the LPCs to provide transparent and simple bills for ratepayers. 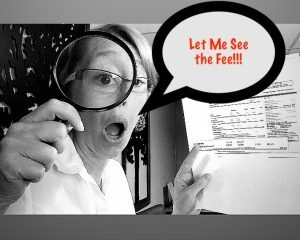 Where the fixed fee is not listed, it is hidden in the kilowatt hour charge, muddling customer’s knowledge about the portion of their bill that they control. Fixed fees cannot be managed by customers, which is one way they hurt low-usage groups like the elderly, low-income, and renewable energy customers. Energy charges are based on how much energy is actually used each month- this gives customers the chance to reduce their energy bills through energy conservation measures. Energy costs are very burdensome in Tennessee. Tennesseans, on average, spend 12.5% of their income on electricity, meaning their energy burden (the percentage of income that goes towards electricity every month) is very high. Across TVA service territory energy burdens can be over 20%. Any energy burden over 6% is considered high. While TVA touts its low rates, it is not dealing with the fact that TVA bills are some of the highest in the country, according to the Energy Information Administration. Some local power companies have made a great effort to keep fixed fees low to help reduce the energy burden on their customers, but with TVA changing its rate structure to ensure revenues, this puts LPCs at risk and is forcing them to increase fixed fees. This is not just a local power company issue, but a leadership problem from the top of TVA. TVA lacks transparency in its rate processes, and TVA leadership has encouraged, if not coerced, LPCs to follow suit. LPCs are limited because they cannot get power from elsewhere and rate changes require TVA’s approval. TVA CEO Bill Johnson claims TVA is the “most transparent entity on the planet.” Yet TVA executives shift costs onto already burdened residential customers and enjoy luxury jets and helicopters, while Bill Johnson brags about a favorable profit margin of $1.2 billion for 2018 because of extreme weather and continues to enjoy his position as the highest paid federal employee at $6.7 million. SACE is taking action. The Renew TN campaign is tackling transparency issues, Tennessee’s high energy burden, lack of new solar projects in the state, and consumer rights such as fair rate design. We think the local power companies will be responsive to customers asking for fee transparency on their monthly bills. Call customer service and ask the general manager to make the fixed fee a visible line item on your monthly bill, or send an email or letter. No time to write a letter? We did most of the work for you! Here is an example you can personalize. Next, go to RenewTN.org and join SACE in building Tennessee’s clean energy future for safer & healthier communities in our state. Together we can make a difference!